Organize anything with anyone—for free! Trello is a visual tool for organizing your work and life. Join more than 35 million registered users to organize all your projects at work, at home, or anywhere in between. Whether you’re planning a website design project, vacation, or company off-site, Trello is infinitely customizable and flexible for your every need. * Get more done with Trello’s customizable-yet-simple boards, lists, and cards. * Go from idea to action in seconds by creating cards and dragging them across the board to follow your project's progress. * Add checklists, labels, and due dates the way you see fit and give your projects the fuel they need to get across the finish line. * Free your brain from remembering every planning detail. * Add Power-Ups like a Calendar view of your due dates or add locations to cards to get a Map view—your project will take on a whole new perspective. * To stay organized no matter where you are, turn on notifications and stay informed when cards are assigned, updated, and completed. * Trello works offline! Add information to your boards and cards at any time and it will be saved for when you need it. We got your back. Trade in your sticky notes (and mental notes) for Trello’s digital boards. Get started for free today! We value transparency and will ask for permissions to access: Camera, Microphone, Contacts and Photo Library Usage. Make life (even at work) more delightful from the comfort of your Lock screen, by answering comments with 5 emoji reactions: thumbs-up, thumbs-down, heart, smiling face, and sad face… Now it's just up to you to pick the perfect fit for your feelings. Good overall but there a few seemingly minor-to-add things that would be significant quality of life improvements. These are what’s missing that I think wouldn’t be hard to add that would be big improvements: ability to sort by due date on the app (this one is hugely irritating since this feature is available on the browser version), ability to select a default auto sorting (like to always have it sorted by due date instead of having to resort it every time after adding new cards), ability to set the times that reminders are sent (as it is it’s just auto set to send a reminder 24 hours before the due date set, and that’s not useful for a lot of things that I need reminders for in school). It would be nice if there was a setting that marked cards as completed in the due date box when they are moved to my “Done” column area, instead of needing to manually do it. It would also be nice if the icon for the checklist on the collapsed cards wasn’t checked off unless all the items on the checklist are checked off; it’s counterintuitive for the box to be shown checked off when I don’t have anything checked off on the checklist. Would be easier to manage what’s done and what’s not visually if the box were not checked until the checklist is completed. I still have to supplement this app with other reminder apps and google calendar and tasks because of the lack of ability to set reminders at specific times/days. I have been using Trello for about a month—for personal and project management at work. It’s best on a desktop, but the app is great too. The app feels a lot like the desktop version which is nice. Trello is flexible, with a simple interface, but has lots of power under the hood if you choose to use it. My boss likes it too, and I’m finally realizing my dream of having a shared company task list. This is definitely more than just a task list though. I’ve tried lots of productivity apps, and I like this one the best by far. Downsides: Desktop version does not work offline. Mobile does, so I use my tablet or phone as sort of a back up. I also wish it was a little quicker (less steps) to do some of the functions on the mobile app, especially to archive (delete) a card. You can drag it to a “done” list though and then archive all the cards in that list from time to time. That works fine, but once in a while I miss a checkbox style way of deleting that would be quicker. The widget allows a pretty quick card add function for doing a quick GTD style item-to-inbox capture, but if that was streamlined even more (less steps) that would be great. 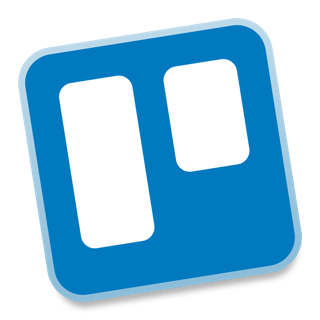 All in all I really love Trello a lot and have recommended it to others. I NEVER rate apps when promoted, but I LOVE THIS APP! It works across the board on browser, Microsoft App, and Apple App seamlessly. You can always access all the information that this program has helped you do. It’s incredible. If you have a team or a boss that tracks updates or information is handed off to team members or otherwise at different stages of the project, this app makes it happen with no fumbles. It is about to replace all my daily recap emails that I send to my boss at the end of my day. He uses my updates as a reminder to him to make sure he doesn’t forget, but even if it is to make sure that an employee is actually completing their work properly, the presence of this app completely removes that “micro-managing” feeling. As a project manager, I am constantly asking a wide variety of people for things and then constantly following up. If I forget to follow up, then that blame is on me at the end of the day. This app lays the whole spectrum out for me and I don’t have to go digging in my email or set a ton of tasks that go off like ticking time bombs. Every step on every project is constantly in front of me and nothing goes unnoticed or forgotten if I have done my job and imputed the info.